Our goal is to help people live the way that they want. Chiropractic is simple. Chiropractic is treating the body without drugs or surgery to help it work the way it should. Your body design is perfect. You can breath, digest your food, and heal yourself all without conscious thought. You do not have to think about it, you just do it. Your Nervous System does this for you. Your brain and nerves control everything in your body. When the nerves are disrupted, things do not work as well as they should. These disruptions cause restricted motion, dysfunction of the different body parts and can cause significant amounts of pain. Is your FAMILY killing you? The last few days, I have been having thoughts about how our families will affect our health. For example, I have a son that is about to go on a mission. Does he affect my health much these days? Will he affect my health more when he is gone? What about any of my other six kids? One of my patients is frustrated with her husband. Will that frustration have an impact on her health? Another patient is in her final semester at college. She has lots of graduate level classes and is involved in the student association for her department. She also has three small kids. Will any of that have an impact on her health? Obviously, the answer to all of those questions is yes. Yes, our families will have an impact on our health. BUT, is that impact all negative? NO! For example, my son comes up with some great stories and some great jokes. That helps me be healthier. As he works on his mission, he will be setting a great example for his siblings. That is good for my family so that is good for me. That makes me healthier. My one patient will have decreases in her health when she gets in disagreements with her spouse, but she also gets increases when she remembers all he does for her and when he does something nice like make dinner or give her a massage. My other patient does have frustration with balancing school and kids and family but when she can get done with homework and play with the kids for a while, that helps her become more healthy and she can balance it all out. Basically, family and friends can help us be more healthy and they can cause us to be more sick. They do both. The trick is to find ways to brush off the negative stress they cause and to maximize the positive stress they cause. This helps us to become more healthy and it makes it easier for us to help them with the things that they need. Remember, negative emotional stress is just as rough on the body as physical stress. It is just as rough on your body when you get in a disagreement with your spouse as it is if you fall down the stairs. But, positive stress can help alleviate that negative stress. If you do feel that your negative stress is overwhelming, give us a call and let us line everything back up straight so you can handle it better and go forward more easily. Who should be seen in a chiropractic office? Only those people who are interested in improving their health. Our most typical patient is someone who cannot do as much as they want. Whether they are being restricted by pain, malfunction, restricted motion or it just does not feel right, our goal is to help each person live life the way they want. So you want to come in, what is the first visit like? For a typical first visit we will spend time going through the paperwork, discussing what is going on now and what may have contributed to your condition. Then we will complete a detailed exam. As part of the exam process we will be using a computerized evaluation to determine how well the nervous system is functioning. It is our experience that by getting the nervous system to function as it should allows the patient to heal himself or herself. After determining which areas are not functioning, we use X-ray to determine what is going on structurally. This structural picture, combined with the functional picture of the exam gives us a more complete idea of what is causing the problem. Finally, a test adjustment will be given to help alleviate pain and discomfort and to start the healing process. This entire visit usually takes about 1.5 hours. The second visit takes about 30 minutes. This visit starts with a video presentation of what we will be doing with this visit and how it will affect your body. Next we go over the X-rays and discuss what was found and what it means and possibly what caused each of the injuries. Finally, we deliver a gentle and specific Atlas Orthogonal Adjustment (http://www.atlasorthogonality.com/). During the third visit, we will see how you have responded to the first two visits and based on your response create a plan together to create a healthier you. I like to wait until the end of the third visit to create a plan because everyone responds to care in different ways and I have no idea what it is going to take until we try a few visits. We are closed Friday, Saturday and Sunday (except by previous appointment). 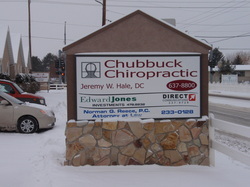 Chubbuck Chiropractic has been recognized as one of the top Chubbuck Chiropractic practices.